I'm really proud that I am an Ilokano. Other people enjoys it how Ilokano people tells a story and hits a kind of jokes, but there's a lot of it to like and love them. Ilocano people basically live in the most northern part or section (mostly in Abra, Benguet, Cagayan, Ilocos Region, Isabela, La Union, Mountain Province, Pangasinan, Tarlac, Nueva Vizcaya and Nueva Ecija) of Luzon, one of the three main island group of the Philippines. 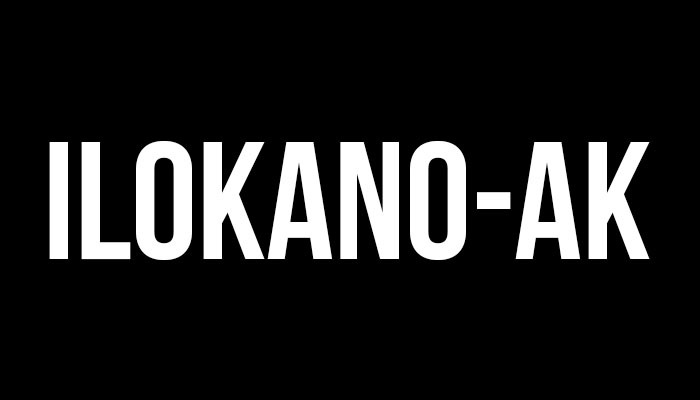 Now, I will be sharing you all the characteristics, behavior, the grammar, what kind of family they have, their foods, and other traits of being an Ilokano. Their physical appearances? Most of them have large eyes and dark skin. The nose are not all flat, nor broad, but flaring to catch the most out of a smell. But, we do also have "tisoy" Ilokano of course. Other says, "Ilokano have dark elbows". You like eating guava with sukang (vinegar) iloco. Your favorite expression is "Mangan tayon!". Your favorite dish is Pinakbet. Caldareta isn't caldareta if it is not made out of goat meat. You know that alcala candy is made from carabao's milk. You eat with a fork or spoon, but not both. Your favorite softdrink is Coke. You make "sawsaw" your bread in your coffee. Your backyard has at least one "tarong" (eggplant) or "paria" (bitter gourd) plant in it. Your favorite is bagoong in your Pinakbet. You return from Hawaii with coolers of marunggai and/or pickled mango. Your favorite dish is "bisukol or liddeg" or "dinardaraan". Your favorite cocktail is "basi" (sugar wine). Your favorite snack is "kilab-ban". If you don't want to use a fork and spoon you say "Kamet!". Patis is common in your household. Your favorite vegetable leaves are "saluyot" and "kalunay". Your Dinardaraan dish is dry and not soupy. You eat with one of your legs propped up and your elbow rested on top of it. You deny being Ilokano by saying "Tagalog-ak!". When they use a fan, they place the open fan right in front of their noses and then move their heads back and forth. When you walk, your shoes sounds "Tok! Tok! Tok!". You insist someone's thinking about you when you accidentally bite your tongue. You're expecting a female or male visitor when a spoon or fork drops on the floor. You're late for something, them the next thing you hear is "Apay ngay nagbayag ka?". A true ilokano "lakay" carries his cigarrillo pack tucked in on top of his shoulder sleeve or rolled up in his arm sleeve. You always ask the vendor, "Is that your fixed price?" You ask your friend to snap a picture of you by saying "Kodaken nak man lakay!". You claim your nationality as "Ilokano" and not Filipino. You fail to pray before meals. You blow your nose by standing on the side of the road, holding one nostril, and blow out through the other. When you meet someone anywhere you hear the usual questions "Naggapuam?" or "Papanam?". When you go to a party, you listen to the background chatter to see if you can hear anyone else speaking Ilokano. When someone does something embarrasing or wrong, you respond by saying "Kababain!". You address your fellows as "lakay". You finish your sentence with "ngarud". When you're broke you say "Awan ti kuarta!". When you get upset you yell "Anya ki din aya!". When you refer to second-hand information you say "kung-kunana" or "kunana met". A quintessential phrase "Ubet mo! ", and the response will be, "Ubet mo met!". You say "Ay sus!" atleast 10 times a day. You preface every other sentence with "Nga" or "Apay". Your father always scolds you with, "Papispisan ka, hala!". You pronounce "people" and "simple" as "pee-pell" and "seem-pell" respectively. You summon someone with a "Umay ka 'toy!" attached to the standard "Hoy! Psst!". You make a comment on somebody's statement by saying "sinabim" as in "sinabi mo" if you are trying to be a Tagalog-ak. When you want something done right away or fast, they say "Darasum!" or "Napaspas!". When you're playing basketball, and you make the shot in front of opponent's face, you say "Rupam!". In response to being surprised, shocked, or faking astonishment, you say "Masda awan ak!". And when someone agree, they say "Masda awan ak met lang!". "Maturog kan!" is heard at least 5 times from both parents before the child actually goes to bed. All your elders are referred to as apo. Your family gathering includes an inevitable game of Pusoy. Your mother and grandmother smoke their "cigarillo" with the lit end in the mouth. You sniff-kiss your balasang or balong. You meet a fellow ilocano and you say "Anya ngay?". You have a copy of "The Last Supper" in tapestry or hang in a wall. You have a 3 foot high wooden fork and spoon hanging up in your house. Your curtains match your prom dress. Your rosary is prominently displayed around your rear view mirror. You could ride across a flooded river standing up on your carabao. You think that every balete (balliti) tree is a ghost's house. Great article, Thanks for your brilliant statistics, the content material is quiet thrilling. I might be watching for your next publish.